Paul Heyman has been confirmed as the inductor for Bill Goldberg at the Hall of Fame, a preview of tonight's Strong Style Evolved card in Long Beach, AJ Styles returns to the ring, Brock Lesnar added to another WWE house show, Impact rating from this week, Kenoh vs. Takashi Sugiura, and more. **Wai Ting and I will be back late tonight with a show covering New Japan’s “Strong Style Evolved” event from Long Beach, California. On the show tonight, we will be joined by Dan Lovranski, who is attending the card live in Long Beach and went to the PWG show on Friday night in Los Angeles. **This week, Wai and I will have two bonus shows for Patreon members on the POST Wrestling Café. On Friday, we will have our monthly ASK-A-WAI show, taking questions from the POST Wrestling Forum, and next Sunday we will have a Patreon show reviewing New Japan’s Sakura Genesis card from Sumo Hall. **We have a live report from reader Michael Szybalski, who attended the WWE house show in Kitchener, Ontario on Saturday night. **We also have a live report from Matthew Smith, who attended the Progress Chapter 65 card earlier today, which was the promotion’s sixth-anniversary card. **New Japan Pro Wrestling will be holding their “Strong Style Evolved” card tonight from the sold-out Walter Pyramid in Long Beach, California. The follow up to last July’s events in Long Beach has already been deemed a success with the immediate sellout of over 4,700 tickets in under 20 minutes earlier this year. If anything, there has been criticism in New Japan’s conservative entry into the country and not booking a more ambitious setting given demand is escalating and no ill-effects of running a card designed for travelers so close to WrestleMania weekend and high-ticket pricing. On paper, it looks like a great show with a set of unique combinations and the main event should be spectacular. The card will be airing live on AXS TV at 8 pm Eastern with Jim Ross and Josh Barnett calling the show and the rest of the world will be able to watch it on New Japan World. For those in the U.S. without AXS TV, they will have to wait until after the live broadcast when it is uploaded to the streaming service. The AXS schedule is listing the show for a four-hour and will have an immediate replay of the event at Midnight Eastern. We will have full coverage of the show on the website tonight and a post-show with Wai Ting and I later tonight. *Kenny Omega and Kota Ibushi vs. The Young Bucks –Everyone expects this to steal the show, so perhaps “steal” is the wrong word to use. It is the first heavyweight tag match for The Bucks since moving up to the division and should put either winner in line for EVIL and Sanada’s tag titles, depending on when EVIL can return. The expectations are so high for this match, it’s probably a match they have been envisioning between the four of them for a long time. One potential story is that Ibushi is run down from the New Japan Cup while The Bucks were off that tour (as one was Omega). There are compelling ideas for either team winning but would lean on The Golden Lovers winning, unless Cody gets directly involved but that would seem to be an undesirable finish. Cody should probably get involved during the post-match for one final angle before Supercard of Honor. *Jay White vs. Hangman Page for the United States title –If this is going on second from the top, it’s a difficult position to be put into. New Japan cards aren’t built like other shows where you can surprise the audience and put a title match on first or second because it’s never done that way but these two going on early with the crowd hot for anything would do them a lot of favors. Page will probably do something crazy and they can rely on an insane moonsault of a ledge or something to draw the audience in. I can see them struggling if it goes long but it’s a great test for these two to deliver. White losing the title so quickly after beating Omega wouldn’t make a lot of sense. *Kazuchika Okada and Tomohiro Ishii vs. Minoru Suzuki and Zack Sabre Jr. –After the outstanding performances from Zack Sabre Jr. throughout the New Japan Cup and anticipation for next weekend’s title match, this is a very solid tag match. It would be a major statement to have Zack submit Okada in this match as a prelude to next weekend’s show, but I feel Ishii is the more likely one to take the fall. The only other option is having Ishii pin Suzuki to set up an IC title match for next weekend, although Suzuki has already begun teasing a program with Tetsuya Naito and has the outstanding feud with Tanahashi too. I expect Zack to be a superstar in this building as the New Japan Cup was a turning point in his career. *Jushin Thunder Liger vs. Will Ospreay –I feel this is going to be great as you’ll have the usual nostalgia love for Liger and anything he does will be amplified to the audience and Ospreay cannot help but have a dynamite performance. Ospreay has won every one of their prior singles matches and he should win this match. They are not even promoting this as a junior heavyweight title match and wasn’t the original plan either with Rey Mysterio hurt. This is the right audience to have this match in front of and think it will be very good. *Hiroshi Tanahashi, KUSHIDA, Dragon Lee & Ryusuke Taguchi vs. Tetsuya Naito, Sanada, Hiromu Takahashi & Bushi –This should be a good eight-man tag, especially with Dragon Lee and Hiromu Takahashi inserted and always have phenomenal chemistry. It is unknown what is next for Tanahashi are losing the New Japan Cup final, although a rematch with Minoru Suzuki is only a question of when. I’d prefer they hold back on Suzuki-Tanahashi until at least one of the Dontaku cards in May unless you need to speed through that feud to get Tanahashi in a position to challenge Okada and stop him from breaking the title defense streak. This match also rekindles the program between Tanahashi and Naito, which was a great feud last year, which unfortunately took place on the same cards as Omega-Okada and was overlooked. *Cody and Marty Scurll vs. Guerrillas of Destiny –This continues the story of The Bullet Club’s infighting, although The Guerrillas, Fale, and Owens have been sidebar issues throughout the feud. *Killer Elite Squad vs. Chuckie T. and Toru Yano –Probably a win for K.E.S. to get them ready for a tag title shot once EVIL is healthy. The tag division is going to be interesting in 2018 with the addition of The Bucks and a ready-made run for The Golden Lovers as champions at some point this year. *Hirooki Goto and Gedo vs. Juice Robinson and David Finlay –The focus will likely be reserved for Goto and Robinson, who I would expect will have their NEVER title match next Sunday at Sumo Hall. *Roppongi 3K and Rocky Romero vs. Christopher Daniels, Frankie Kazarian & Scorpio Sky –Not a bad way to kick off the card. SoCal Uncensored is a major group for Ring of Honor and I would expect Romero is here to take the fall. 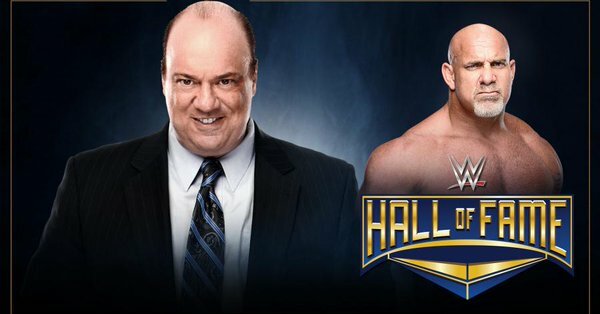 **The WWE announced on Sunday that Paul Heyman will be inducting Bill Goldberg into the Hall of Fame on Friday, April 6th at the Smoothie King Center in New Orleans. The news of Heyman inducting Goldberg was first reported months back by Dave Meltzer in the Wrestling Observer Newsletter with Goldberg serving as the headliner for the class of 2018. **Brock Lesnar has been added to the WWE’s house show this Friday in Boston at the TD Garden. Lesnar will be defending the Universal title against Kane and Braun Strowman. **AJ Styles returned to the ring on Saturday night at the SmackDown live event in Trenton, New Jersey. Styles teamed with New Day defeating Rusev, Aiden English, Shelton Benjamin & Chad Gable in the main event. Kevin Owens and Sami Zayn showed up at the event and cut a quick promo. They were removed from the advertising to sell their firing from this past Tuesday. **New Japan World has posted a sit-down interview with The Young Bucks promoting tonight’s match with The Golden Lovers, why they challenged Kenny Omega, moving up to the heavyweight division and Kota Ibushi’s relationship with Omega. **The Raw crew has a show in Buffalo, New York tonight at the KeyBank Center with Roman Reigns vs. John Cena advertised for the main event, along with a handicap match with The Miz, Curtis Axel & Bo Dallas vs. Seth Rollins and Finn Balor. The SmackDown crew has a show in Fairfax, Virginia with the same eight-man tag as Saturday night’s show in Trenton. **Impact Wrestling averaged 362,000 viewers on Thursday night’s episode on POP TV. This was their second-highest average since last summer and continues the streak of increased viewership throughout March. This past week’s episode was built around the reveals of the Feast or Fired briefcases, including Ethan Carter III being written off the show and being fired. **A media event was held at the New Japan Dojo in Los Angeles on Saturday with a small number of tickets sold for three matches that were presented. The dojo will be run by Katsuyori Shibata as the head trainer and Scorpio Sky will serve as an assistant. In speaking with media, Shibata stated that he is not retired yet following his head injury at Sakura Genesis in April 2017. **I finally had a chance to watch the Kenoh vs. Takashi Sugiura match from NOAH’s Great Voyage card on Yokohama earlier this month. It was a great match with Sugiura hitting multiple Olympic slams and submitting Kenoh with a guillotine choke. The critical element was the post-match confrontation with Atsushi Kotoge entering the ring to make the challenge for the next title shot. Kotoge grabbed Sugiura by the head and drilled him with a headbutt to the front of the head. Granted, he placed his hands on the head and you didn’t have a perfect angle to view if he used his fingers to absorb a portion of the blow, but it was such a hard headbutt that damage was done and Sugiura was bleeding from the contact. This probably fell under the radar because it happened on a NOAH card, and granted New Japan has still had some of the sick head butts since the Shibata injury, but this is at the top of the list of spots that need to be eliminated from wrestling.